This example simulates the lookup of a customer&apos;s account balance. The NVelocity step uses conditional statements to evaluate the account balance dollar amount and produces a custom message to communicate the account holder&apos;s "status" with the company based on the evaluation (either "Standard," "Classic Plus," or "Premium"). The string message output is used to populate an email body sent to the customer. First, in a Designer Folder, create a new flow. 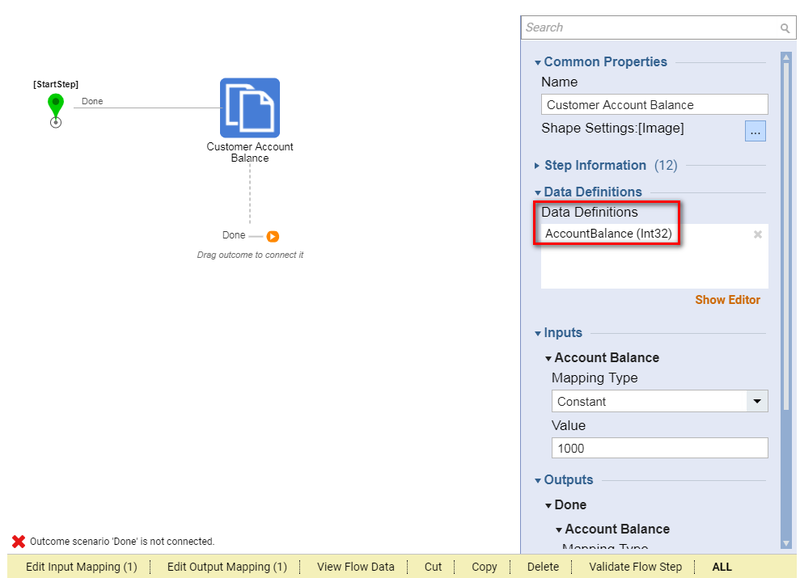 In this example, a Create Data	component is used to provide a constant, numeric value to simulate an account balance. In a production environment, this could be a database lookup of an account balance. The Create Data	step is found in the Toolbox	under the Data	category. Drag and drop this component into the workspace. Connect the Start	step to the Create Data	step. Next, add the Custom Merge [NVelocity]	component. From the Toolbox	, expand the Data > Text	category. Drag and drop the Custom Merge [NVelocity]	component following the Create or Copy	Data	step. 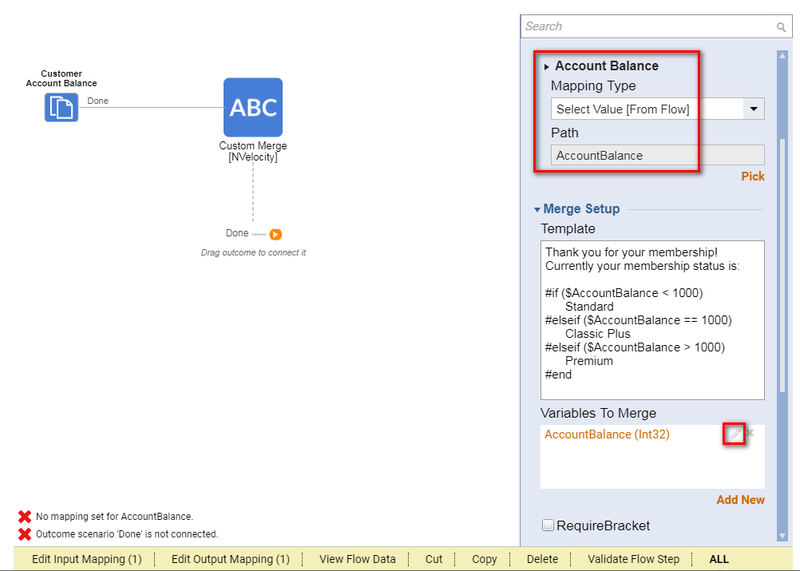 Connect the Create or Copy	Data	step to the Custom Merge [NVelocity]	step. Click on the Custom Merge [NVelocity]	step. As variables (i.e. 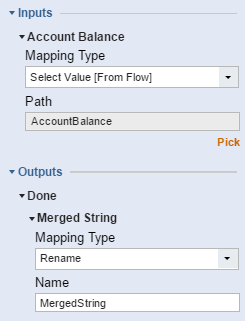 $accountbalance) are entered in the Template	field, the MergeInputData	field populates. 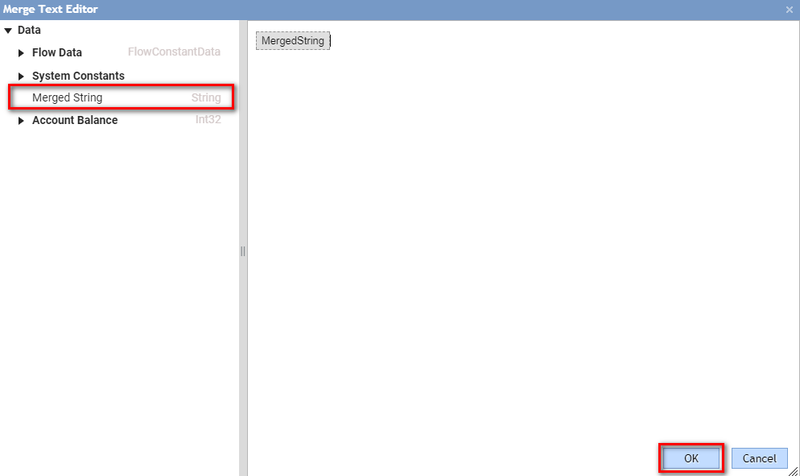 For each variable defined, click on the variable in the MergeInputData	field, and click the Edit	button. 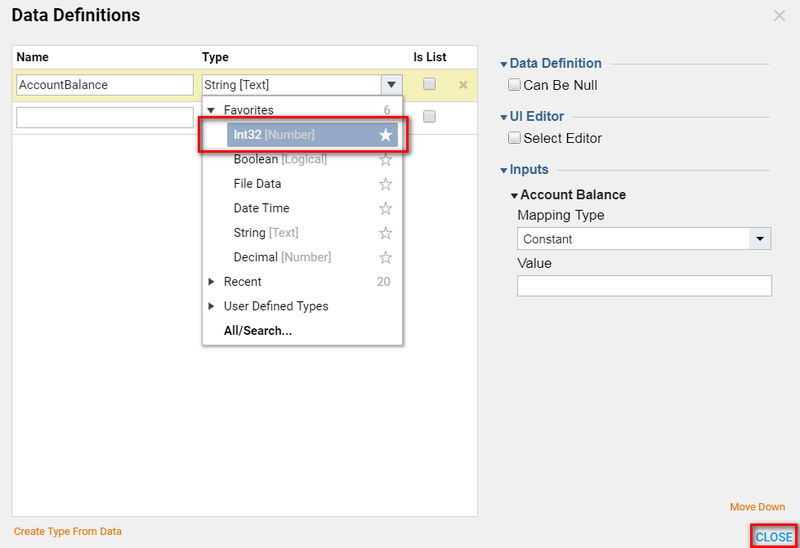 Set the appropriate data type and click OK	.
Lastly, to complete the configuration of the Custom Merge [NVelocity]	step, select the accountbalance Input data (which is the output of the Create or Copy Data	step). This is the integer that will be evaluated by the Custom Merge [NVelocity]	step. Configure the email To, From, and Subject line information, and in the Body	field, select theText Merge Plain	option. 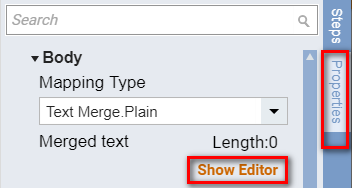 Add the MergedString	variable to the Merge Text Editor . 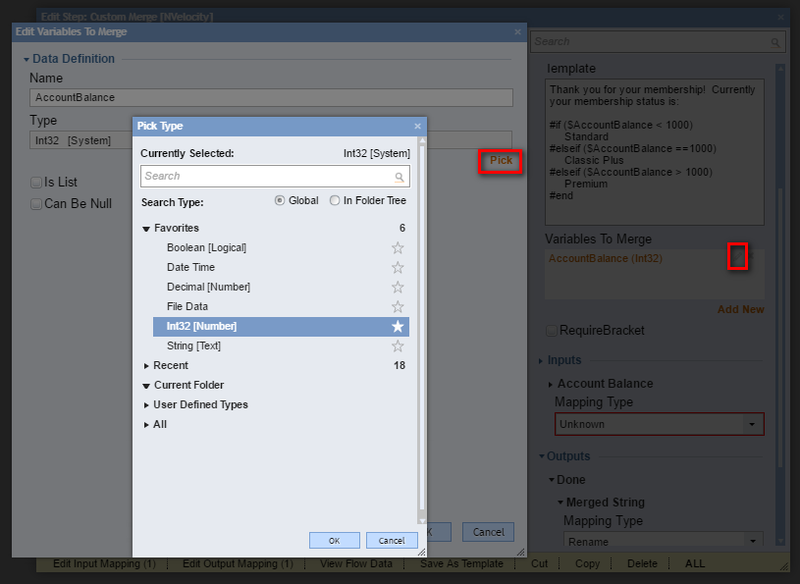 When the flow runs in the Debugger, an email is sent displaying the membership status as "Classic Plus" since the account balance amount is set to 1,000. Change the value of the Create Data	step to different numeric values to see the other if statements of the NVelocity step applied.